I used to think that the Star Wars aliens had the most obvious names in all of fiction. And then I was introduced to Masters of the Universe. When there's a character made of ice and snow, he's not going to be called Justin. Or even Nanook. He's going to be Icer, and I suppose that's all right, since it fits the basic plot lines and premises of the show. 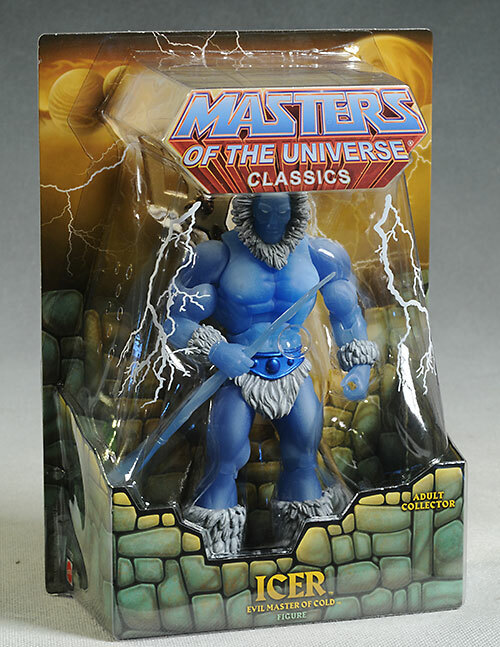 Icer is the first release in the Masters of the Universe Classics sub-series based on the Filmation cartoons. Five more are planned, and there's a separate subscription for these. Icer cost the now usual $27, no small price to pay. Whether these 6 characters are worth it is still to be seen, but now that we have Icer in hand, we have our first impression. Mattel has stuck with the same package design - mostly - through the entire run, and lots of MOCers appreciate that. The consistency looks great when you're displaying packaged figures. Of course, if you just open them anyway, you probably aren't too worried one way or the other, but for you, it's nice to know there's no twisties. A couple rubber bands, but no twisties. From the front, this is a very cool looking figure. 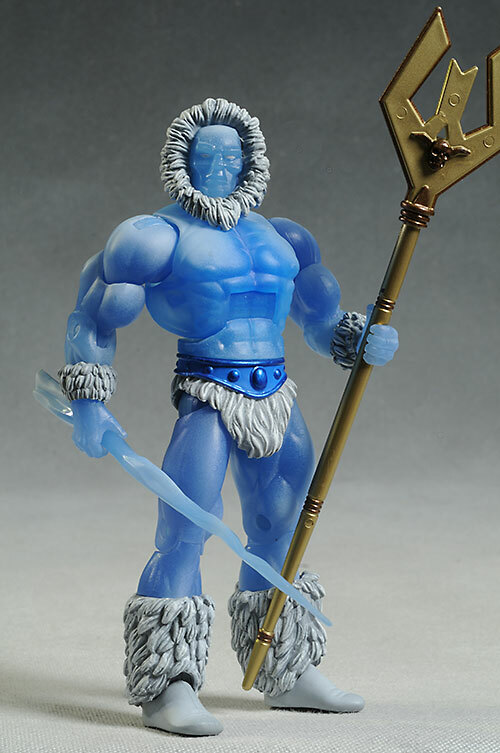 There's not a ton of new here, with the base body and loin cloth being pretty much untouched. He does have fur around the face, wrists and ankles - he's wearing Uggs! But that's pretty much the only changes to the standard body, and there's no additional armor. 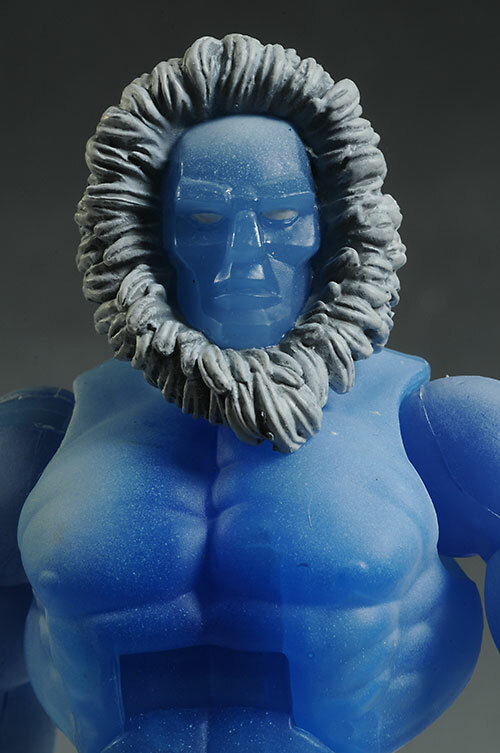 The face sculpt is new, of course, and has the angular sharp look that you'd expect from an ice character. It's not super complex, and the expression is somewhat nondescript, but it works considering the theme. He stands great on his own of course, and the hands are sculpted to hold the accessories nicely. He stands the same 7" as most of the rest of this line. The coolest new feature is the paint job. 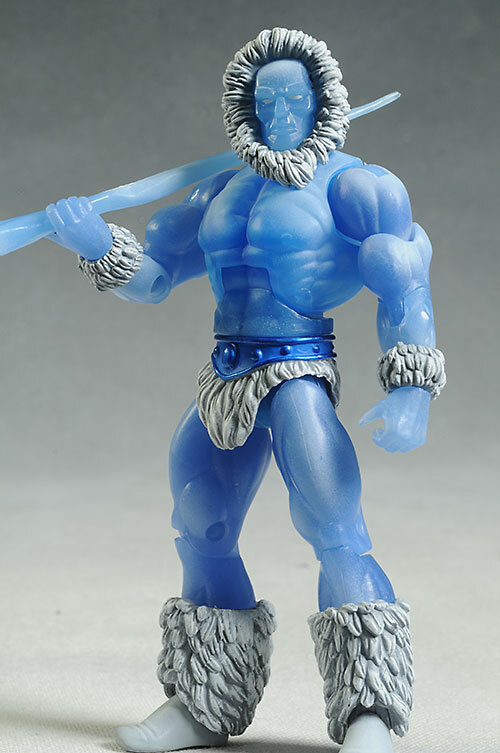 He has a translucent blue body, with a white frosting that gives him that cold, icy appearance. It works extremely well, and the white fur (is it wolf? polar bear? Abominable Snowman?) contrasts beautifully. 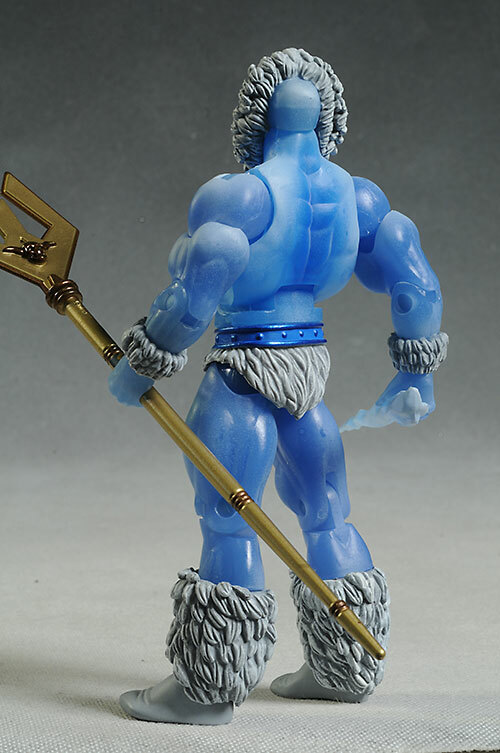 If you're a MOTUC fan, then you know this story - ball jointed neck, ball shoulders and hips, pin elbows, knees and ankles, cut wrists and waist, and an ab-crunch adds up to some great articulation. Every joint here is tight and sturdy, and there's very little restriction from the design. He stands great on his own, even in deeper poses, although if I could have one extra joint it would be a rocker foot to allow them to remain flat on the ground in more poses. 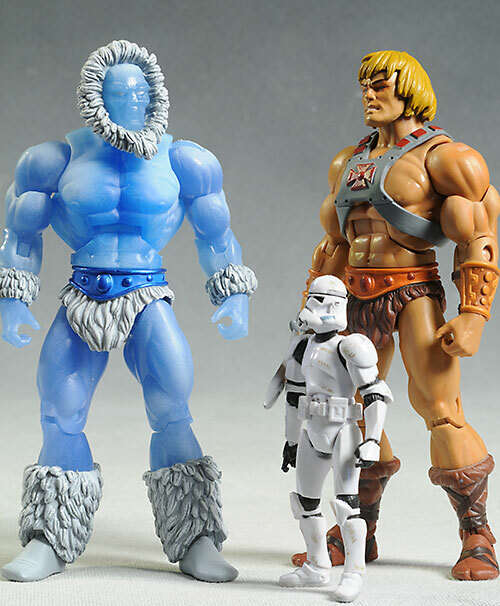 We've gotten accustomed to paying a higher price for the MOTUC figures, but the array of extras that we usually get (including extra heads) help make it feel less painful. 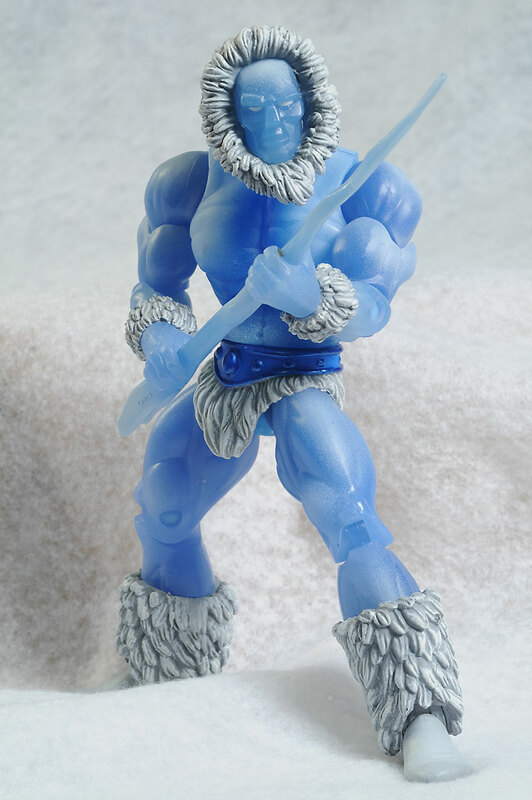 Icer doesn't come with as many goodies this time around, adding to the rather basic feeling you get when you open him up. There's two accessories - a large, dangerous looking ice spear, and a new golden staff, which is the animated version of the Staff of Avion (which can go with Stratos as well). Both are well done, with interesting sculpts and clean paint, but that's pretty light for a figure at this price point. These figures might be intended for adult collectors with a nostalgia for the past, but they are still fantastic toys, with great articulation, sturdy construction, and excellent play value. They are toys first, and collectibles second - as a toy collector, I appreciate that. This figure was almost $30, with no armor and only two accessories. 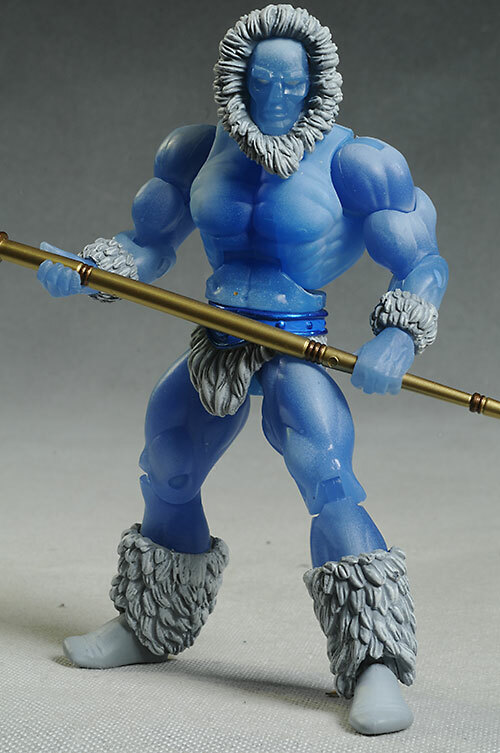 While the sculpted fur at the head, ankles and wrists is nice, I'm not sure it's enough to convince me this figure is worth $27 plus shipping. From the front, this is a great looking figure. From the back, I have to admit that the weird fur wreath around his face looks odd. It's less restrictive than a sculpted hood would have been, but it's still really goofy looking from the reverse angle. It reminds me of El Seed from the Tick. The only other real issue here is that for almost $30, you're getting a lot less figure. Most previous releases had some sort of removable armor, and many had additional accessories, including the occasional second portrait. This guy is a much weaker value than many other releases, and that's probably going to be true of a number of the Filmation sub-series. 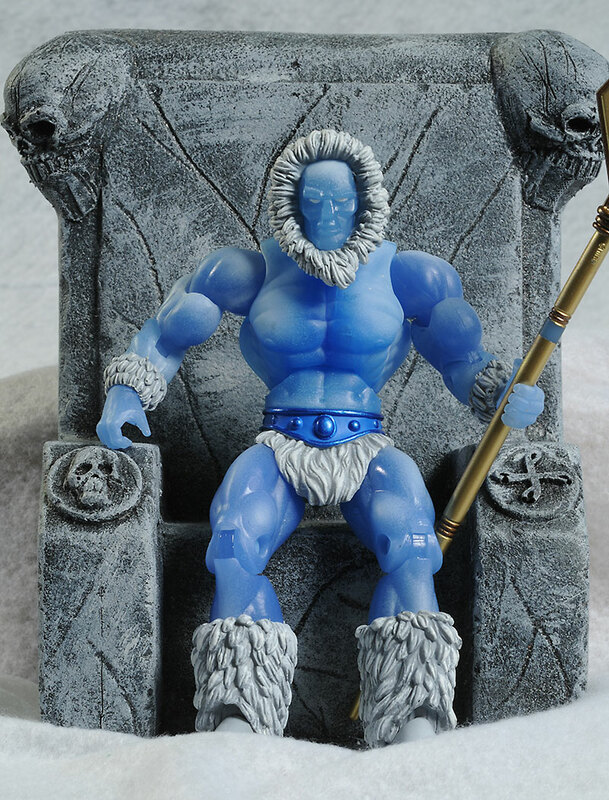 Obviously, you should have already picked him up at Matty Collector, where the MOTUC releases still do sell out. Your best bet now is probably to search ebay for a deal. I have no shortage of MOTUC reviews, including Octavia, Snake Face, Jitsu, Ram Man, Mosquitor, Castle Grayskullman, Rattlor, Mekaneck, Sir Laser-Lot, and before that we had the cool Griffin, Slushhead, the excellent Draego, Kobra Khan, Sorceress, Demo-man, Fearless Photog, Snout Spou, Wind Raider, the large Megator, the giant Tytus. Leech, Icarius, Clawful, the Faceless One, Catra, Sy-Klone, King Hssss, Vikor, Buzz Off, Grizzlor, Roboto, Gygor, Chief Carnivus, Whiplash, Orko, Count Marzo, She-Ra, Optikk, Evil-Lyn, Moss Man, Trap Jaw, Adora, Scare glow, Teela, Man-at-arms, Hordak, Zodac, Faker, Mer-man, Stratos, Webstor, Tri-klops, and starting out with He-man, Skeletor and Beastman together in one review.